Students for a Democratic Society demands justice for the murder of Stephon Clark by Sacramento Police department. 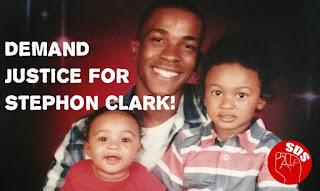 Stephon Clark, a 22-year-old African-American man, was fatally shot 20 times while he stood in his grandparents’ backyard. Police say he was holding a gun, then they changed their story to say that he was holding a crowbar, before finally it was revealed that he was holding his cell phone. The police also proceed to turn off the audio on their body cameras. The police have shown that they are not trustworthy. The police shot 20 times; it is absurd that any police officer would be so threatened by a single person that they would need to shoot 20 times. 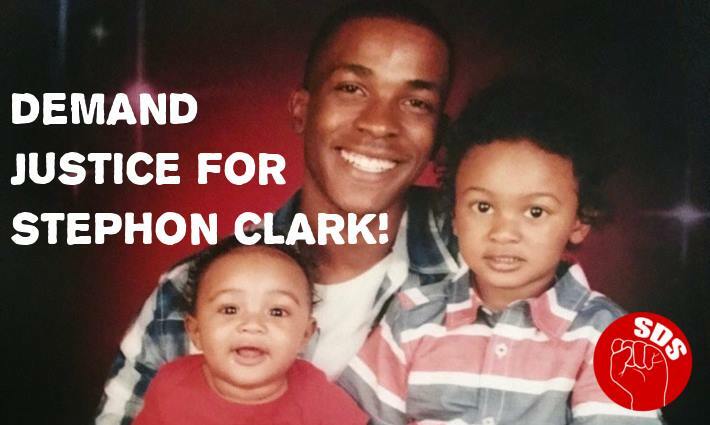 Stephon Clark was a father of two, a one-year-old and a three-year-old. Now two young boys have to live with the murder of their father, a brother has lost a lifelong friend, and a mother has lost her child. This story is not a new one, as African-American, Latino, and other people of color are frequently killed by the police. Just in 2018 so far, 244 people have been shot and killed by police officers. Disproportionately 25% of them have been African-American despite African-Americans comprising 13% of the US population. In all cases except for a few, those very police walked away with no penalties whatsoever. Justice has been denied so frequently that most people aren’t shocked by this news. Along with the racial discrimination in social and economic institutions (“first fired, last hired” for jobs, being forced to go to more poorly funded schools, etc. ), this brutal violence keeps members of these nationalities living in fear, working the poorest jobs, and enduring untold poverty. SDS commends the protesters who marched for days in Sacramento over the weekend and the Sacramento Kings basketball team who demonstrated their support by wearing T-shirts with “#StephonClark” on the backs. Today we stand with the youth and community members who rally against police crimes and the hundreds of thousands of students in the March for Our Lives Movement saying, “Enough is Enough”. SDS stands in solidarity with Black Lives Matter and Black Lives Matter Sacramento and calls for an end to police violence and racist gun violence, for the removal of the officers responsible for the murder of Stephon Clark, and for them to be prosecuted for murder. Furthermore, we call for police departments everywhere to be demilitarized and for the formation of civilian police accountability councils, where community members can carry out investigations into police crimes and power can be put into the hands of the people.